This time around we’re going to be looking at some first basemen! Sure, he didn’t continue to homer on 93% of the balls he put in play at the best HR launch angles (24-32°), but his 40% rate on those fly balls put him in the elite tier for all of MLB. As the 95+ mph chart shows, he has elite power to both centerfield and the pull side, while showing excellent opposite field power as well. I don’t currently own Matt Olson anywhere, but very much wish I did. His value is obviously much higher in OBP leagues versus that of leagues that use batting average due to striking out in a quarter of his plate appearances. 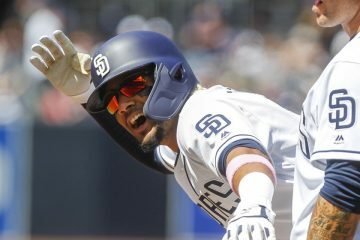 If he can find a way to cut that strike out rate down and put more balls in play he may find his way to a 30 homer season, but for now that’s approximately his cap. 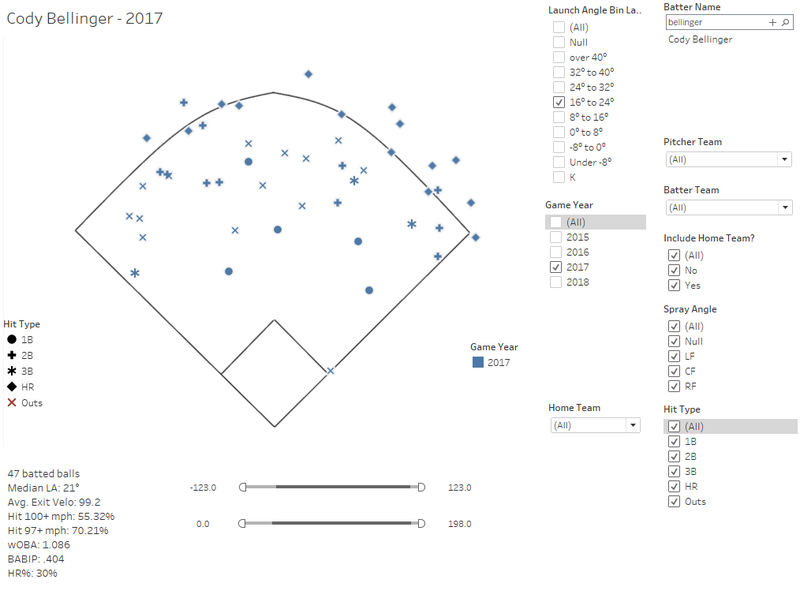 If you check out the red box on his chart you can see his uptick in line drives kept his batting average up despite the fact his HR/FB rate came back to earth in 2018 (16% instead of 41%). As a parting thought on Olson, here are his BABIPs on Ground Balls, Liners and Fly Balls excluding balls hit straight up (40°+). He did seem to finish the year with some over-achievement here and there is probably a realistic chance he hits .230 so be careful not to overrate him if you’re playing in a batting average league. 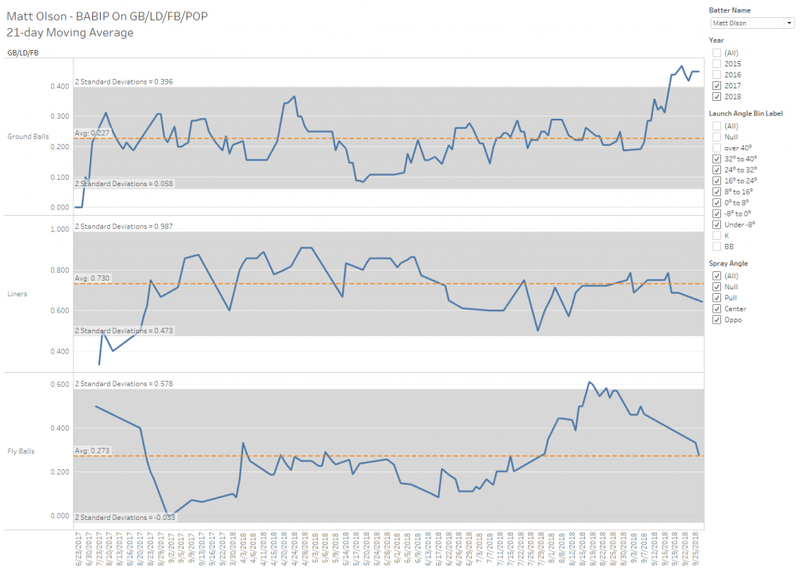 At age 24, we’re hoping there is still improvement in the K% rather than regression. Josh Bell took a major step backward in fantasy baseball last year, though he maintained his mid-330s wOBA in clockwork like fashion (.339, .338, .336) by taking more walks last year. That being said, the balls he puts in play are atrociously bad. 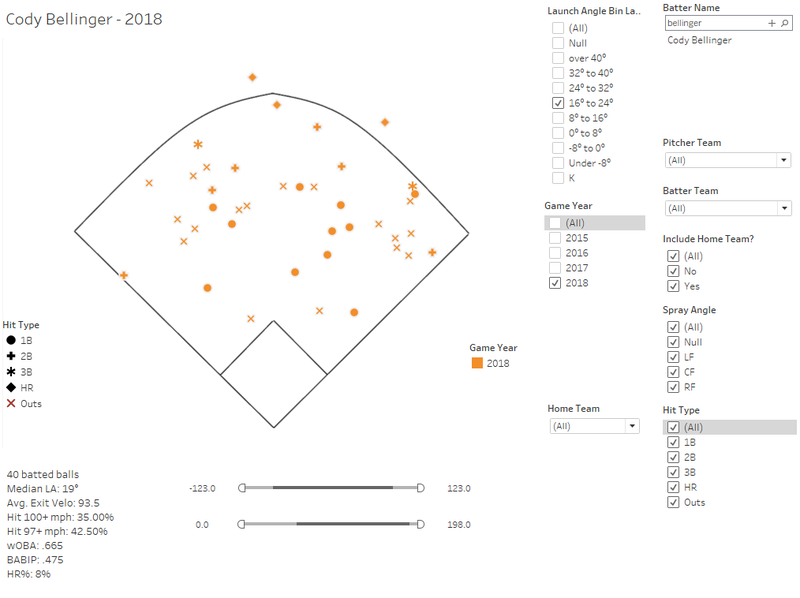 According to the data, it appears Josh Bell took a new approach to hitting baseballs, specifically in the air, where he went from a 34/36/31 spray distribution to 21/41/39. As you can see, this isn’t a good look for Josh Bell. His wOBA on pulled air balls is generally around 1.100 vs. ~.400 to center and the opposite field. If this is the new look Josh Bell, you don’t want any piece of it. In the glass is half-full take you could say this is a good time to buy low and bet on the 26 year old to come back to how he was hitting the ball in 2017, but I’m not buying. We had some banter within the rankings debate about how we’ll likely be ranking Bellinger the #1 1B at this point next year, and it’s hard to disagree with that logic. He’s coming off a “down” year in relation to his rookie campaign, yet objectively he didn’t really do anything different other than barrel slightly fewer fly balls. And more specifically, it was in a very specific bin of flyballs – those hit at 16-24° – the low drives. In 2017 he elevated more of these balls closer to the 24° cutoff and hit a greater percentage at 98+ and 100+ mph, whereas in 2018 his distribution of launch angles for these “fliners” was lower and less well struck. IS RHYS A POOR MAN’S BELLINGER? If we take the entirety of the duo’s 2017 and 2018 plate appearances, we see that Hoskins looks a lot like Bellinger with a higher walk rate. Hoskins has actually pulled the ball just a little more (43% vs. 38%) than Bellinger, but they both homer at approximately the same rate on fliners (grey bin), fliers (black bin) and floppers (32-40°). Bellinger chips in a few more swipes in a given year, but these two are neck and neck in the power categories. Bellinger also maintains a slight batting average advantage over Hoskins due to his foot speed as well as hitting from the left side of the plate combined with a slightly lower launch angle approach. 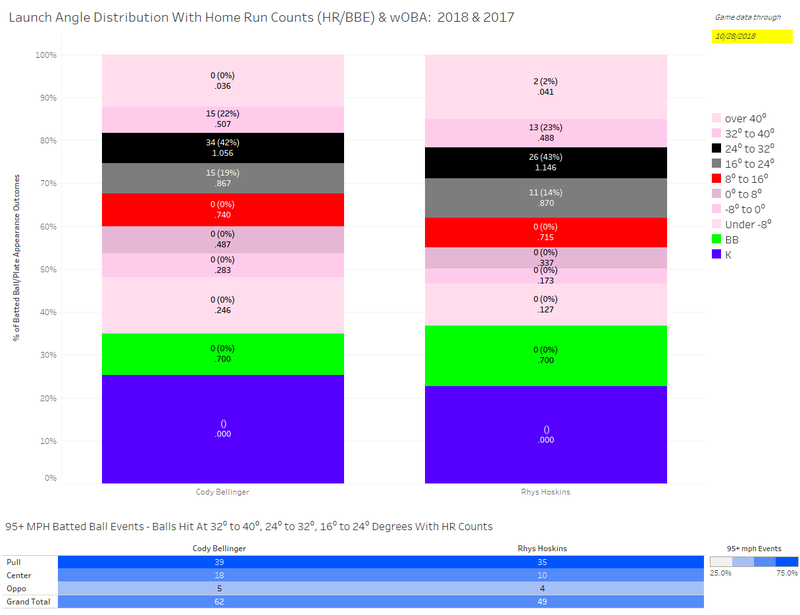 Hoskins’ current approach will always handicap his BABIP due to all the fly balls combined with his lower groundball BABIP. Aguilar is so damn consistent. He just hits the ball hard, all the time, in the air, to all fields. There is almost no peaks and valleys in his approach. 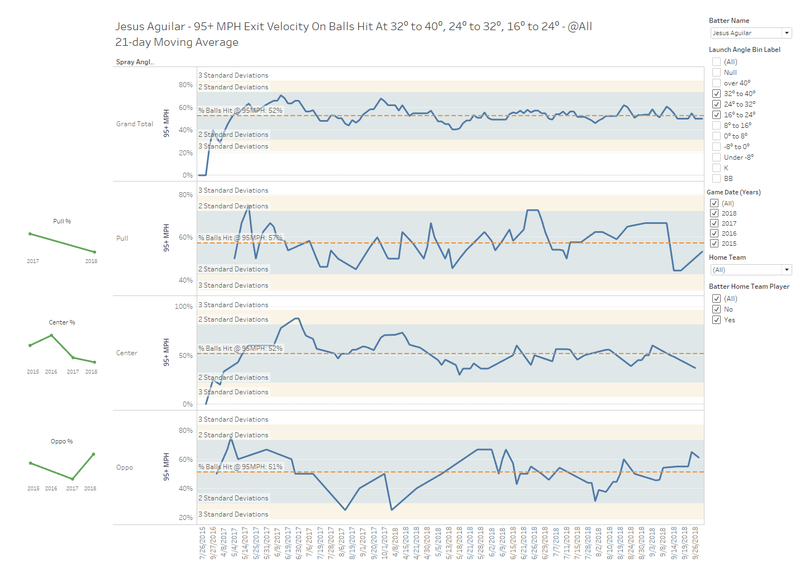 Check it out; every other ball he hits is at 95+ miles-per-hour. This is why I’m not scared of making strong-buys on the powerful Milwaukee masher. Sure, he’s not a spring chicken, but I imagine the power output over the next few years will look a lot like Paul Goldschmidt. These three youngsters all debuted in 2018, so this is the first time we’ve got Statcast’s batted ball data to work with to paint a picture of how they currently hit. Keep in mind, this trio struck out a lot in their debuts. Our Prospect Guru, Jesse Roche, called Rowdy Tellez’ debut “loud” and I certainly can’t disagree. He hit half of his balls between 8 and 32 degrees and put up a .900 wOBA. 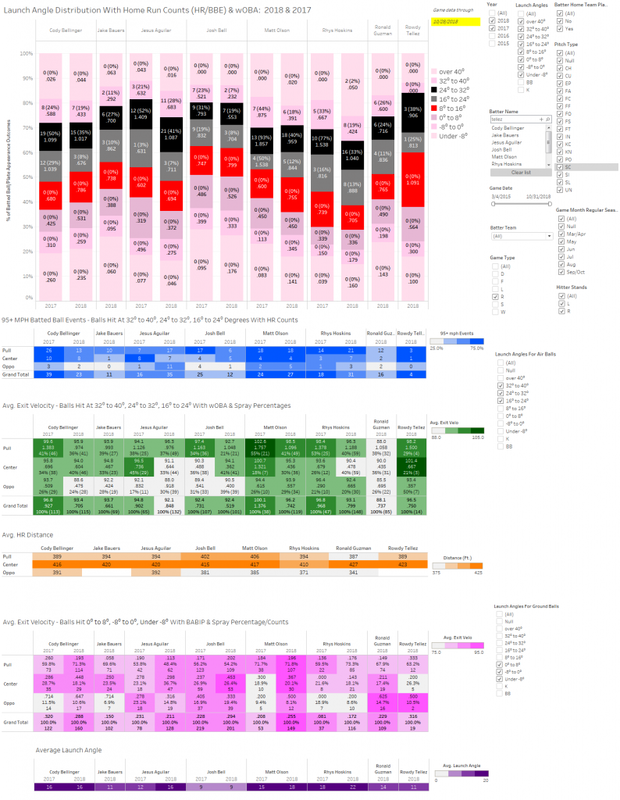 Totally a small sample size, but we can see the power was on display to all fields. Jake Bauers transitioned his fantastic walk rate straight-away to the majors. In terms of his game power, he does have the ability to pull the ball with power as well as hit it pretty well to centerfield in the air. He’ll need to use some of that approach on his liners and ground balls in order to avoid getting BABIP’d to death by the shift. 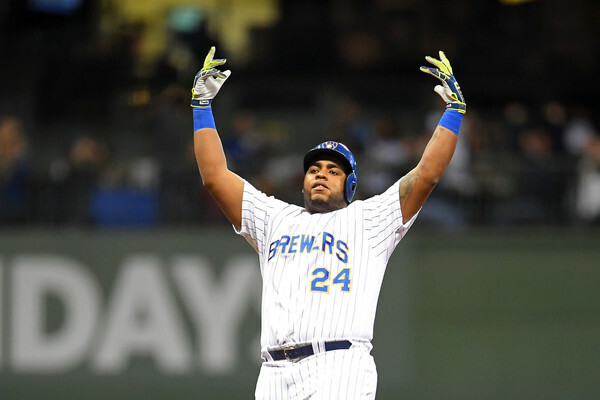 Finally, we’ve got Ronald Guzman who still hasn’t figured out how to utilize his big frame to hit the ball with authority. While he does barrel up his fair share of balls, he also still makes a lot of weak contact resulting in a very mediocre average exit velocity on flies.